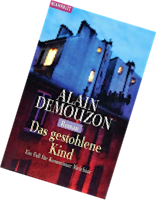 A NOVELIST, a short-story writer and a screen-writer, Alain DEMOUZON published almost fifty books since 1975, most of which are mystery novels and “romans noirs”. A father of three, he lives in a small house in Paris. Brigitte, his wife, is a wardrobe assistant and a costume designer for the cinema and the theatre. Alain Demouzon was born on Friday 13, July 1945, in Lagny-sur-Marne at about thirty kilometres East of Paris. His parents were farming supplies retailers. After an MA in French literature at the Sorbonne, a bachelor’s degree in teaching sciences, one year of teaching and another one for his military service, Demouzon occupied various jobs in the movie business. That’s where he met his wife. Terminated in 1973, he took advantage of this time to start and write a first novel, then a second one, Gabriel et les Primevères, which will be published by Flammarion in 1975. This hundred year old book house would soon publish his mysteries, as part of a collection, of which he’ll be the sole author. He was then considered one of the leaders of the renewal in French detective literature, and a worthy successor for Georges Simenon. With Mouche and The First Born of Egypt, “Le Monde” newspaper praised him with laudatory criticisms. The thirteen novels published by Flammarion would impose an original style, one often close to more general romanesque literature, with a great care given to writing — which unsettled both his readers and those used to more surrendering to stereotypes. In the early eighties, Alain Demouzon wrote reportages about news stories for the weekly paper VSD (“Friday-Saturday-Sunday”) and a regular column in the monthly detective literature magazine Polar. At the same time he started a series of “solve it yourself” puzzles, of which commissaire Bouclard was the hero. But writing scripts took more and more of his time. 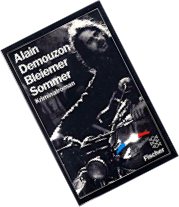 From 1980 to 1983, Alain Demouzon would become the first president of association “813, les Amis de la littérature policière” (Friends of detective literature), of which he was one of the instigators and founders. The future Bibliothèque des littératures policières (Library of detective literatures) was a project close to his heart and would achieve in 1984. On several sessions of the Reims detective novel and film Festivals, Demouzon would get the pleasure to welcome numerous authors from abroad. As vice-president of the Union of French speaking writers, he’d sit at the Professional Commission of the Social Security of Authors, of which he’ll be the president for three years. In the neighbourhood where he lives, passage Bourgoin, near the rue Nationale, he founded the citizens’ association Inter-Nationale-Bourgoin, which he’d preside for a dozen years. Despite all these activities, Demouzon published work regularly. 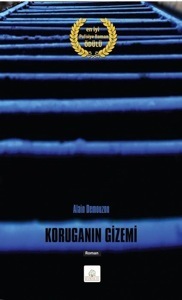 In 1995, Calmann-Lévy publishing edited Melchior, first volume of the existential adventures of an atypical detective. The writing of this especially dense and demanding series would continue throughout six thick volumes. Agence Melchior was released in 2006, by Fayard, followed by Un amour de Melchior, in April 2008. From the French — Publishers Weekly, July 24, 1978. Founded in 1974, Peebles Press is beginning to spread its wings. Late last year when the small New York house’s president Sandy Lesberg was in Paris, he heard about a novelist, Demouzon, whose mysteries are being published by Flammarion. 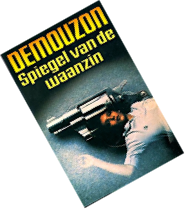 Laudatory reviews likening Demouzon to Simenon helped Lesberg decide to buy translation rights to not one novel, not two, but nine — for publication over a three-year period. With the first, Mouche, scheduled for September, Peebles will inaugurate a mystery-detective series, The Midnight Library, featuring works of European and American authors. The second Demouzon, The First-Born of Egypt, is to appear in December. Bookshelf — Paris Metro, September 15, 1978. The French Review, The University of Alabama, vol. LIV, n° 6, May 1981. 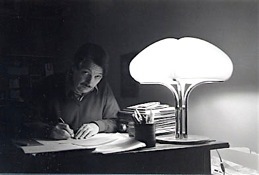 Self-portrait, from the late website romanpolicier.com, December 2000. BiLiPo, Bibliothèque des littératures policières. Alexandre Lous, Le Magazine littéraire, avril 2003.